Our friends Jack and Will over at JD Editorial were kind enough to review a night of fine food and after dinner entertainment held courtesy of G Casino Newcastle to sample their taster menu. The team at Scobberlotch kindly invited us to the Grosvenor Casino in Newcastle on Sunday 5th May for what was billed as “a meal and some entertainment”. Intriguing as this did sound, only when we arrived at the venue did we discover that we’d been asked along for a sample taster five-course meal and an evening of mind-reading with the wonderful and intriguing Mind of Kennedy*. The waiter wandered over with what looked like a mug of soup each for us. Fear not though, it had a larger capacity than its appearance suggested! Taste-wise, the soup was rich and buttery, and the bread lived up to its “crusty” billing. All in all, I’d say a nice starter. (J) An unidentified, ambiguous coloured soup was presented to us and I wasn’t sure what to expect. I’m not normally a big fan of soup but despite not knowing what the flavour was, I dived in; figuratively not literally obviously! It was a tasty, well seasoned, warming soup with chunky vegetables served with soft, crusty bread. A very tasty course that I would highly recommend. The stilton glazed mushrooms were extremely tasty. They were served on a small slice of toasted bread in a wonderfully creamy sauce. This mushroom crostini is definitely something that I would order again. (J) The name of this course on the menu probably didn’t do it justice… Firstly, it was made up of numerous button mushrooms on a slice of ciabatta; secondly, the “stilton glaze” suggests merely a colouring of flavour. However, the garlicky cheese-based sauce was creamy, coating the mushrooms and seeping into the bread beneath. For me, this was my favourite dish of the night. These were also quite tasty. The vegetables had good flavour and were well cooked. However, they were served with a portion of potatoes which were both cold and had a peculiar taste. I think they may have been cooked in some sort of mustard which isn’t my cup of tea but that’s not to say that they’re not for you! Accompanying this dish was a creamy herb sauce which was a real delight. 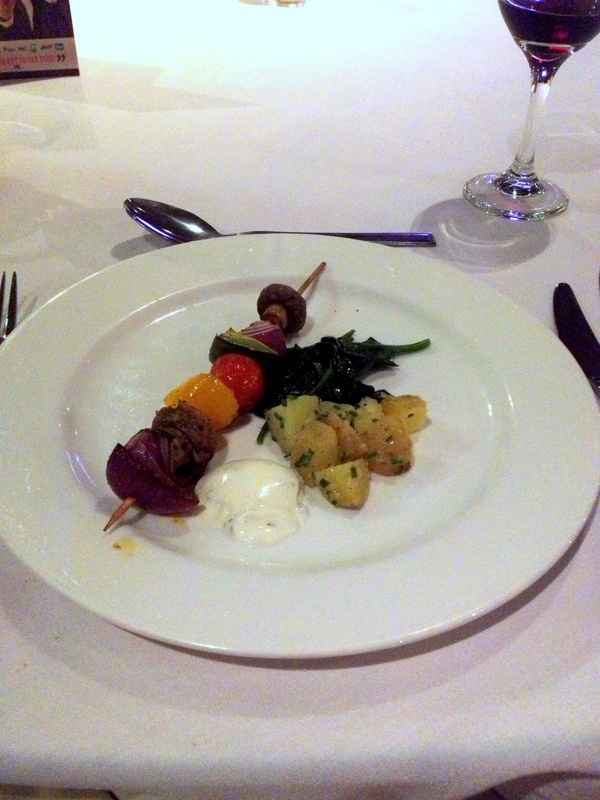 It was excellent, I thought it really complimented the vegetable skewers and was a refreshing addition to the plate. (J) In contrast with the previous course, this was somewhat disappointing. 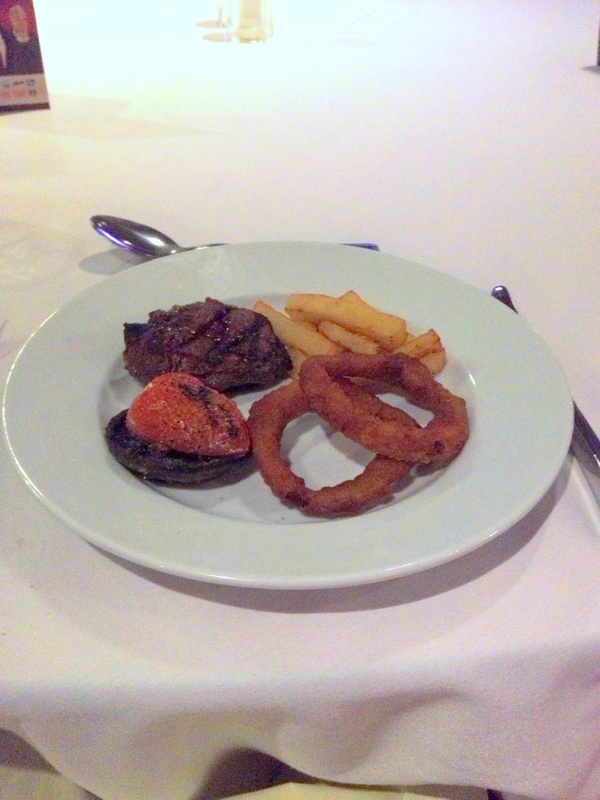 The spinach served on the side was nicely cooked – just wilted – however the vegetables lacked flavour. When out for a curry, I would generally go quite high up the spice scale and do enjoy a hit of chilli. Unfortunately, I don’t think this was my lack of tastebuds at fault; a slightly more liberal use of spices would have made for a very nice vegetarian course. This was my favourite course by quite some way, the steak was absolutely sensational. It was well seasoned, tender, well cooked and full of flavour. The onion rings on the side were a revelation as well as they were crispy, had a strong flavour, weren’t greasy and had a good onion to batter ratio. Overall I’d say this was a truly fierce plate of food. The only thing missing was a dollop of Heinz Tomato Ketchup! (J) The taste of this dish rivalled the mushroom course (and Adebayo Akinfenwa’s full-on BEAST MODE in the League One play-off semi-final) for my ‘man of the match’ award; the steak was cooked excellently for my taste, and the seasoning on all elements of the dish was perfectly judged. Personally, I felt that this wasn’t a great dessert, but that’s only my personal opinion. My biggest qualm was indeed that both whipped cream and ice-cream were served on the same plate. This violates one of my many culinary etiquettes and commandments. I was genuinely abhorred and disgusted. 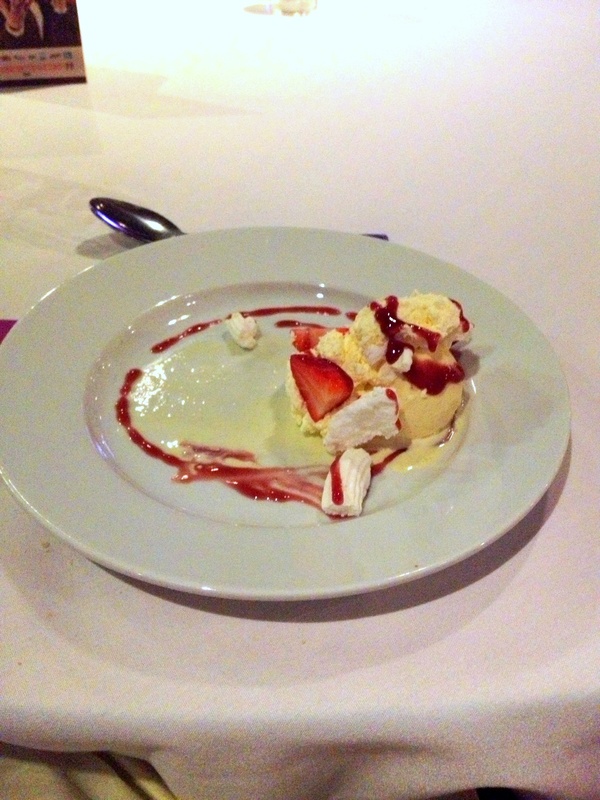 Alas, the strawberry sauce, fresh strawberries and meringue were all quite enjoyable. In addition, I’m not sure how one could justify this being called a sundae as there wasn’t that much ice-cream, it wasn’t served in a glass and only vaguely resembled a sundae. (J) The billing of a ‘sundae’ was a little misleading – although maybe that’s just down to my last experience of a sundae, after which I felt compelled not to eat anything sweet for about 36 hours. On the whole, it was a very tasty dessert, but there was a distinct lack of meringue in my portion, leading to a cream:fruit ratio issue. I have nominated you for the Versatile Blogger Award! Details are on my latest post.